Complete with brown soft cotton interior, PU leather back and hard wearing PU fabric front panel, with Velcro fasting for the flap. The Harris Tweed genuine label is mounted onto a PU leather border sewn onto the front of the case to make this the perfect unisex gift. The fabric of the case consists of a traditional herringbone design including browns/greens, and provides a classic British Look. 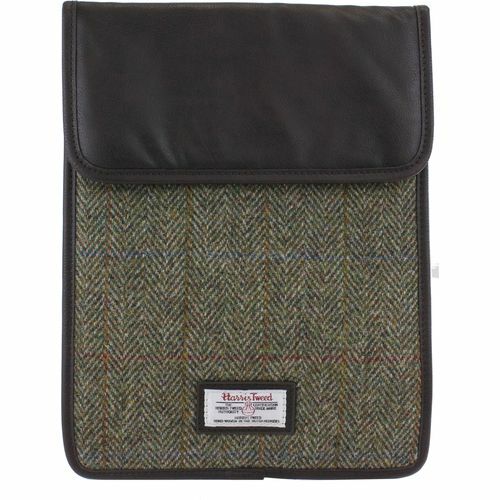 Treat yourself or a friend to a gorgeous iconic handmade Harris Tweed i-Pad cover combining perfectly luxury with protection. This has to be the most stylish way to carry your i-Pad or any device with the same dimensions.